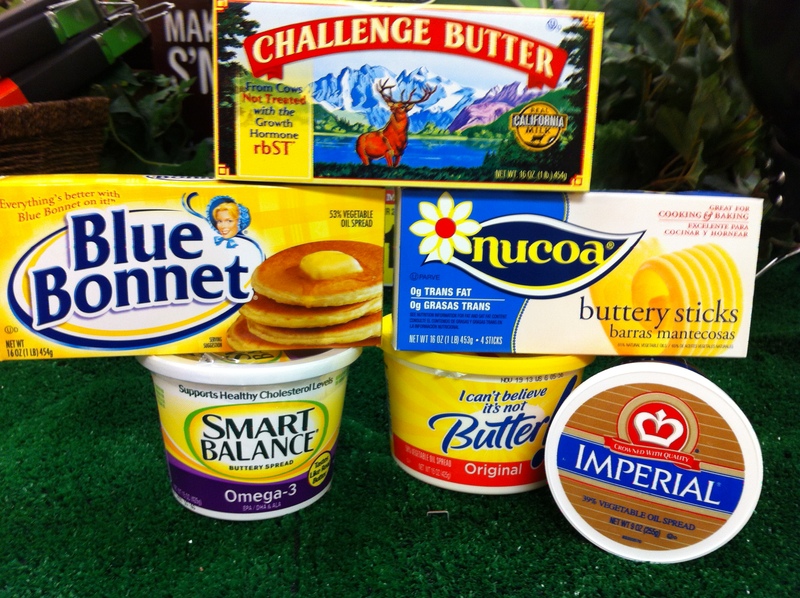 Which is the better choice, butter or margarine? To clarify, I’m talking about everyday use, not baking. I’ll do a separate post on butter vs. shortening in baking so stay tuned! For years, we used trans-fat free margarine (although not for cooking). But then, recently I decided that butter really is better… at least from the standpoint of pure ingredients without a lot of additives. This was a perfect excuse…after all, butter is just cream and salt right? So we started using it (in moderation of course) and man were we happy! I thought this was a good decision until studying the topic more for this blog. So what is the best choice then? Some of the newer margarines that are low in saturated fat, high in unsaturated fat and free of trans fats are fine as long as we don’t use too much (as they can be high in calories)-see why this topic gets so confusing? Both butter and margarine (trans fat free) have about the same amount of calories. It’s best to use butter sparingly because of its saturated fat content. Too much saturated fats increase the “bad” cholesterol (LDL) as well as the “good” cholesterol (HDL). This can all lead to increased risk of heart-disease. We should consume about 10-15 grams of saturated fat daily to stay in the healthy range. One tablespoon of butter contains over 7 grams of saturated fat (yikes). The FDA now requires that labels include information about both saturated and trans fats…so check your labels! Olive oil is actually healthier than butter or margarine. Maybe we should take a tip from the Italians, and dip our bread in olive oil instead of using butter! Butter contains two ingredients that raise cholesterol: dietary cholesterol and saturated fat. It is recommended that we consume no more than 200 milligrams of cholesterol daily. Butter has 33 milligrams per tablespoon so be careful! I hope this doesn’t make you too depressed…after all, butter tastes SO much better than anything else. But when you think about the health implications, isn’t it best to be wise? I guess we’ll just go back to using butter once a week on Sundays! Great food for thought. I do love butter, although I’ve mostly given it up. I love that you listed your references. Great work.